Time to refresh your CPR and first aid skills? 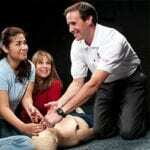 Do you hold a CPR or First Aid certificate from another training organization? If so, you are eligible to attend the Emergency First Response Refresher course. 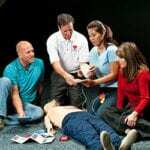 Plus, you can get Automated External Defibrillator (AED) training at the same time you refresh your CPR skills. Re-certification is required every 24 months. This program also provides an excellent opportunity for experienced divers and instructors to continue their education. Course participants must complete the DAN First Aid for Hazardous Marine Life Injuries examination with a minimum passing score of 80 percent. The instructor will review the examination with each participant to ensure 100 percent understanding of the material. Perform a scene safety and initial assessment. Provide injury management for stinging envenomations, spiny envenomations and contact injuries. Manage a severe allergic reaction. Re certification is required every 24 months. Whether you are diving a few hours from shore or days from civilization, dive accidents frequently require more advanced levels of care than are offered by traditional or entry-level CPR programs. CPR Health-Care Provider with First Aid (CPR HCP) teaches advanced techniques of basic life support. This course is ideal for dive professionals and divers interested in understanding the next level of resuscitation techniques. It is designed to be applicable to the diving market — featuring scenes and scenarios pertinent to diving situations — as well as the nondiving healthcare market. CPR HCP also includes basic life support skills for adults, children and infants. This program meets 2010 International Liaison Committee on Resuscitation and American Heart Association guidelines on Cardiopulmonary Resuscitation and Emergency Cardiac Care. Course participants must complete the DAN CPR: HCP examination with a minimum passing score of 80 percent. The instructor will review the examination with each participant to ensure 100 percent understanding of the material. Perform one and two rescuer CPR. Provide assistance to a choking adult, child and infant. The DAN Diving First Aid for Professional Divers course is designed with aquariums, commercial diving companies and scientific diving operations in mind where the provider may be exposed to both the general public and diving specialists as part of their job. It is also an excellent risk management course for the recreational dive community due to its comprehensive first aid coverage. This program includes Emergency Oxygen for Scuba Diving Injuries, Neurological Assessment, First Aid for Hazardous Marine Life Injuries as well Basic Life Support: CPR and First Aid. It is based on guidelines provided by the U.S. Occupational Safety and Health Administration (OSHA) for workplace CPR and first aid. Retraining in this program is required every two years following successful completion of the course — although some local protocols and regulations require more frequent retraining. Knowledge and skill development= 2 daysThe time needed to teach the course varies depending on several factors including the number of students and their ability to process the educational components of the program. A rescue diver who has a current CPR certification from another agency may still earn the DES recognition by completing Emergency Oxygen for Scuba Diving Injuries, First Aid for Hazardous Marine Life Injuries, AND Neurological Assessment. Dive Medicine for Divers (DMFD) provides a comprehensive educational approach to diving physiology and first aid. Ultimately, enhancing our knowledge and understanding of how our bodies react to the pressures and stresses of diving lead to safer diving practices.Dive Medicine for Divers is for individuals interested in better understanding dive physiology and dive safety. It includes topics not normally addressed in dive training, including fitness to dive, safety planning and basic physical examinations. The modular approach presents a number of lecture topics and discussions presented by a DAN Instructor integrated with video segments and additional self-study information.Upon completing the components of each level, divers will learn the various basic first aid skills involved in assessing and caring for an injured diver. They will learn ways to prevent dive accidents and how to respond to them when they do happen. 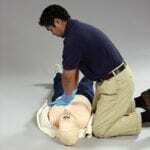 Taking dive first aid courses is highly recommended for skill development. Fitness to dive – Discusses physical fitness and medical conditions that can keep divers out of the water and explains basic ear-clearing techniques. Safety planning – Addresses processes and procedures to make your dives safer and actions that can be used in dealing with the aftermath of a dive accident including handling of the diver’s equipment for an investigation and taking care of the rescuers’ emotional needs. Basic examinations – Introduces the use of a stethoscope in determining the presence (or absence) of breathing sounds. 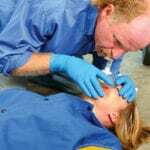 Decompression Illness and Barotrauma – Reviews decompression theory and provides an overview of decompression illness including a short discussion of neurological symptoms. Presents an introduction to dive accident management and what happens during a hyperbaric chamber treatment. Explains the various potential barotraumas to which a diver can be exposed and their identifying symptoms. Participants will examine several dive accident cases and how they were treated. A final discussion will address important elements of accident and injury reporting. Equipment related issues – Teaches essentials of cleaning, sanitizing and maintaining equipment with emphasis on accident prevention. Allergic reactions and taking blood pressure – Participants learn proper use of an EpiPen® and how to take a blood pressure. Gas toxicities and partial pressure – Covers nitrogen narcosis, hypercapnia and oxygen toxicity and examines gas laws and the physiological impacts the human body experiences under pressure. Drowning – A discussion of the cascade of events that can lead to a diver’s death and preventative measures. Providing care and the Good Samaritan Law – Understand the obligation and/or consequence of providing care. Emphasizes the appropriate role of the rescuer. Ear barotrauma – Introduces the Teeds Scale and includes photos depicting various ear injuries. Covers basic ear anatomy and visualization with an otoscope. The IQC follows a modular format. There is a Core Module and then a separate module representing each training program. You can take all nine modules as part of one course, or just take the Core Module and one course module – whatever you are interested in teaching. Later, as long as you remain a current and active DAN Instructor, you can take additional modules without retaking the Core Module. The Core Module is now available online in English and Spanish. (*) Any scuba diving instructor, assistant instructor, or dive master/dive con who is also a CPR and First Aid instructor with a recognized training agency can attend the IQC.